I had absolutely no idea what the Paleo diet was about until about 4 weeks ago. I read an article on it about a month ago and it definitely grabbed my attention with all the benefits it boasted – not only weight-loss. After reading more and doing some research on the Paleo diet , I found a local company called FitChef and asked them for more information on their Paleo-style meals. Their response time was great and very friendly and extremely helpful. After a few discussions, they have allowed me to give their meals a try for 21 days. I have to say, I consider myself SERIOUSLY lucky that I was given the option to try this way of eating. Not only has it changed my waistline in a week, it has changed my way of thinking about food. I can write a whole lot of info about the brand and the company, but to be honest – they have more than enough information on their website to tell you about themselves and their food. So, I’m going to tell you what I have learnt about them over the last 2 weeks. In a nutshell, they create and deliver frozen meals to your door that that are super-duper healthy and follow a Paleo-style of meal (refer to Paleo Diet background info below). The people behind this company have a passion for what they do and what’s even better, they live the lifestyle too which I believe counts for a lot! From what I’ve read and heard, they have done a lot of research into the freezing of meals (making sure nutrients remain after freezing specifically) and the types of ingredients they put into the foods. Just from meeting with them and eating the foods, I’ve learnt a lot about food! On their website, they claim you will most likely lose around 2kgs per week. This sounded GREAT when I read it, so decided I had to try it and see for myself! As an entrepreneur who works long hours and is a full-time Mom, I have to admit that meals for me are a ball-ache of note to make. My kids eat a decent meal, but I’m generally quite happy for toast or something that is most likely not good for the waistline. 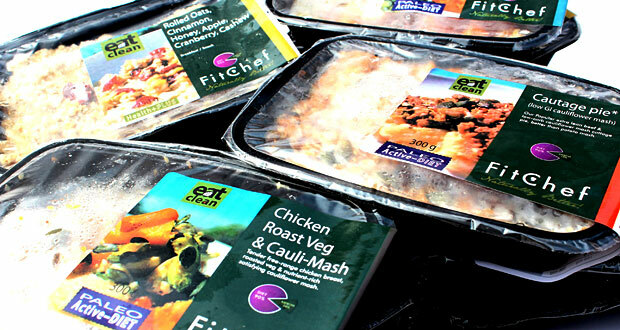 Over the years, I have tried a few frozen meal companies and have often been left disappointed with the taste or how the meal defrosts or looks and feels after being heated up. Most are often tasteless or often mushy or become watery after heating. Fitchef has been completely different for me so far. The meals are tasty and they are clearly healthy. They are not mushy at all or dry after heating up – I’ve actually found everything to be very juicy. The first 3 days weren’t particular easy as I’m a carboholic and sugarholic, so it took some effort on my part. The first 3 days were definitely the worst – I craved peanut butter toast (my favourite!!) and I got frustrated with not eating what I wanted despite the fact that I was enjoying the meals. I was slightly hungry for those first 3 days, but since Day 4, I have been absolutely fine. I’m not hungry and I can even eat less at this point. It has actually been a wake-up call for me and has helped me identify something which is very clear to me now and that is: I am an emotional eater, so I have been eating more than I need. Linseeds and pumpkin seeds have become apart of my daily meals (they appear to be in most of the meals) plus healthy smoothies which aren’t as bad as I thought they would be. I’ve never been a green smoothie gal, but after having it twice a day now, it’s enjoyable! There are other smoothies available – the favourite for me being the Beetroot one which they did warn me about. I have had noticeable differences in my energy levels and in my skin, funny enough. My pants are definitely looser than last week. Unfortunately, the day I started, the scale broke – can you believe it!? It was not due to my weight (thank goodness), but rather to old age and abuse from 2 young children! So, I am not able to give you a confirmed weight-loss amount YET, but people are commenting that I’ve lost weight and clothes are loser, so something is definitely happening! I will be following this eating plan and posting about it for the next 3 – 4 weeks. I will update you on my weight loss and share everything with you from costing to each meal and more! P.S. I bought a scale this weekend, so I’ll give you an update on how things go!. The Paleo Dietis based upon eating wholesome, contemporary foods from the food groups our hunter-gatherer ancestors would have thrived on during the Paleolithic era, the time period from about 2.6 million years ago to the beginning of the agricultural revolution, about 10,000 years ago. These foods include fresh meats (preferably grass-produced or free-ranging beef, pork, lamb, poultry, and game meat, if you can get it), fish, seafood, fresh fruits, vegetables, seeds, nuts, and healthful oils (olive, coconut, avocado, macadamia, walnut and flaxseed). Dairy products, cereal grains, legumes, refined sugars and processed foods were not part of our ancestral menu. I just wanted to tell you how much I enjoyed reading your article. I also love peanut butter and just the thought of melting butter and hot peanut butter on crunchy toast sends me off into another place (far away from seeds, cauli mash and carrots.) Hope you manage to get a set of scales – I can’t wait to hear how much you’ve lost!